Protesters march against Rosia Montana Gold Corporation on September 15, 2013 in Bucharest. BUCHAREST (AFP) – (AFP) – Romanian president Traian Basescu on Monday urged the government to withdraw a disputed bill that would clear the way for a huge Canadian gold mine in Transylvania. Basescu said the bill to allow the mining project, which has prompted huge protests across Romania and been criticised by environmentalists, was unconstitutional. “The best solution would be for the government to withdraw the draft law from parliament,” he told a press conference. Canada’s Gabriel Resources hopes to extract 300 tonnes of gold from a mine in the picturesque village of Rosia Montana, and has promised 900 jobs during the 16-year extraction period. Critics say the mine will destroy four mountain tops and threaten the area’s Roman mining galleries. The project will also use thousands of tonnes of cyanide to extract the precious metal and require hundreds of families to be relocated. Last week Prime Minister Victor Ponta gave in to mounting protests and admitted that the bill, which is aimed at speeding up the project, would fail in parliament. 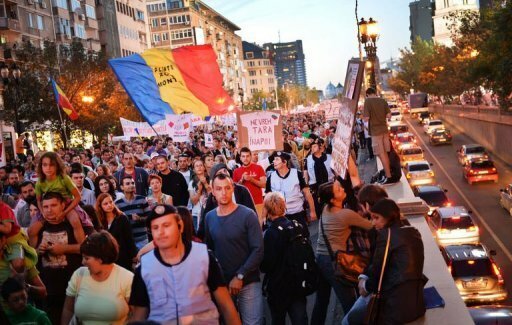 However, a negative vote will not necessarily torpedo the mine project, and on Sunday between 20,000 and 25,000 people rallied in Bucharest and other major cities to call for the government’s resignation. “If the bill is not withdrawn the debates could last for two months and this would be a disaster, it would cause enormous tension within society,” said Basescu.